ZEO, Inc. is a leading producer of natural zeolite products, which are used in soil conditioning, water filtration and animal feed additives. With the use of extensive research and field trials, ZEO, Inc. has developed new products with improved results. Their test and research data is displayed on the ZEO website in the form of pie charts, graphs, tables, illustration and animation. The infographics used on their website show customers how ZEO's products can improve results in a range of industry applications. Pie charts, such as the one shown here, are not typically used to compare scientific data, because it can be difficult to visually compare the pie slices. However, using the pie chart to illustrate the total composition of EcoSand, in conjunction with the percentage values displayed, leaves no doubt in the viewers mind as to the exact percentage of each element. 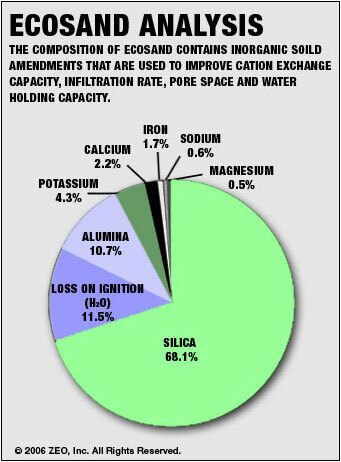 This infographic pie chart with percentage values displayed, illustrates the composition of EcoSand, a soil additive used to improve turf quality.